What is a shadow day at Ursuline High School? A shadow day is an opportunity for eighth grade students to spend the day at Ursuline and experience firsthand what it’s like to be a member of the Ursuline family. Students that shadow are paired with an Ursuline student, usually a freshman, for the day to attend classes, go to lunch and get a true feel for student life at Ursuline. When should I schedule a shadow day? Eighth grade students can schedule their shadowing dates anytime from mid-November through May. How many students can schedule on a single day? Ursuline reserves the right to decide on the number of students who shadow at Ursuline on a particular day; however, normally no more than 4 students will be scheduled to shadow on a single day. How far in advance should I schedule a shadow day? Please allow the staff three school days to schedule a visit. Is a shadow day a full day or a half-day? We recommend that students shadow for the entire day to fully experience life at Ursuline, however half days can be arranged at the request of a family. How do I schedule a shadow day? Those interested in shadowing should call Ursuline at 330-744-4563. What is a shadow day like? 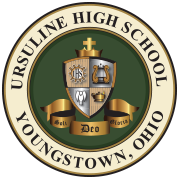 Students shadowing should arrive at Ursuline by 7:45 a.m. and report to the Main Office (2nd floor). There the students will be paired with their Ursuline host for the day. The school day ends at 2:30 p.m. and the shadowing students may be picked up in the Main Office where they will return after the dismissal bell. Ursuline provides lunch, although a student may bring his/her own lunch. What is the dress code for a shadow day? Students shadowing at Ursuline may dress casually. Ursuline asks that students do not wear ripped pants, sweatpants, leggings, or yoga pants. Athletic wear is not appropriate for a Shadow Day. While the shadowing students are not required to wear their current school uniform or the Ursuline uniform they are asked to dress appropriately. Can I shadow with an Ursuline student that I know? Yes, if a student knows a current Ursuline student they would like to shadow, parents are asked to make that request known when they schedule the shadowing visit. If shadowing students do not know any current Ursuline students, the shadowing student will be paired with an Ursuline student based on interests in academics, extra-curricular activities, etc.